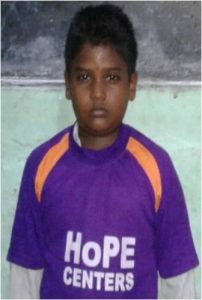 Thangaraj lives with his parents and sister. His father is a farmer and his mother is a housewife. He was accepted into a HoPE Learning Center last year and is grateful for support from caring teachers and an opportunity to reach his goal of becoming a teacher so he can help other children end generational cycles of deep poverty and the daily hardships that come with it. It doesn’t take much to uplift the destiny of a child like Thangaraj. Right now, only $9 a month covers the costs of HoPE Center sponsorship, tutoring, lessons, materials, themed activities, and daily mini meals for one child. For only $300 a month, you can sponsor an entire HoPE Learning Center filled with 40 children.